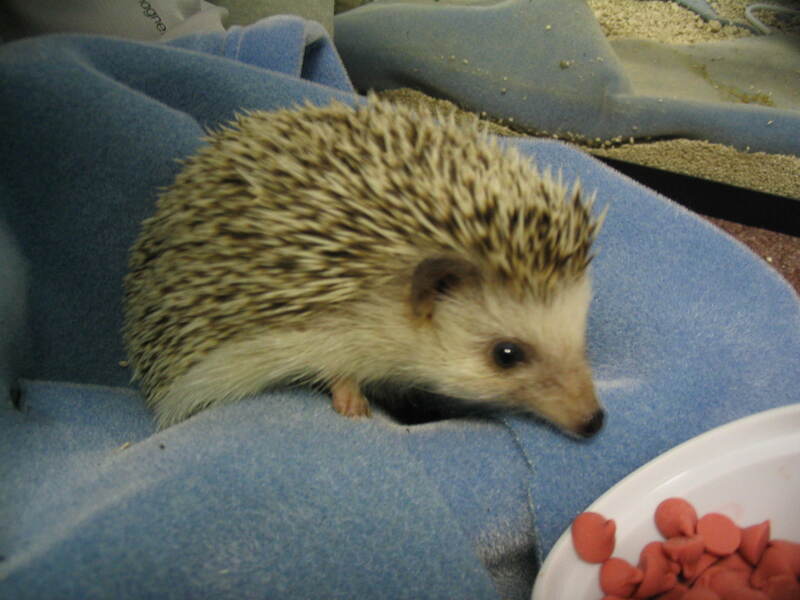 A couple of days before Christmas, my husband came into the study with my present, a 2-month-old hedgehog. I had a hedgehog a couple of years ago, but Jean-Luc has passed on to the great hedge. So my family thought it was time for a successor. Jean-Luc had been a sweetheart. He was very even-tempered and would sleep in my sweater or shirt on my arm. I could give him tummy rubs and pet his chin. I thought he was a typical hedgehog. Having been the human for several cats, I should have known that there is no such thing as typical. The new guy’s name is Horatio, Lord Nelson, but I like to call him Sir Grumpy. The first few times I took him out of his cage, he got into extreme protective mode, and I could barely pick him up without gloves. He’d huff and chuff and do his very best to intimidate me. It was kind of amusing when you consider that he weighs about a pound (he’s an African pygmy hedgehog, not the larger variety you find in Europe). I would speak softly and try to get him to relax. No chance. He wasn’t happy, and I was not going to change his mind. I don’t really see the point in having a pet that I can’t cuddle with, so I was not happy with Horatio. My husband said I wasn’t spending enough time with him. Who wants to spend time with something that spends all its time making threatening noises and pretending to be a hand grenade waiting to go off? But obviously, a new tactic was needed. So I decided to try a few minutes every night rather than going for an hour or so. Progress! He actually let his quills soften to the point I could pet him. And he stopped pooping every time I had him on my lap. Major bonus. But then I missed a couple of nights. Apparently Horatio has a little clock or calendar in his cage. When I went to get him out, he was back to his old self, grouching around. So he was adapting to having a human! But he wanted a human on his terms – whatever those were. Horatio does not like to be woken up. Hedgehogs are nocturnal, but we have to keep a blanket on his cage right now. It’s too cold for him without a heater and we need the blanket to keep the heat in. As far as I can tell, he has decided that nighttime is when the television turns off until he gets tired in the morning (sometime around 4a). Which is actually pretty good, except the only time I can get him out without waking him is before work. Since I start work at either 6a or 4a, depending on the day, it would mean I have to get up really early to play with him. Then I would be really grouchy. A couple of days ago, I was home sick and got up early. I had an idea and put some pillows around to create a sort of “run” for him. He loved it. The first thing he tried to do was get out (of course). When that didn’t work, he spent quite a while happily wandering around, sniffing everything. The cats were fascinated, but smart enough to stay away from the quills. Horatio finally figured out how to escape, so I put him back in his cage. He was not a happy hog. He huffed and he puffed and he scratched at the newspaper on the bottom of his cage. He’d get on his wheel for a couple of minutes then get off and stomp around some more. I am trying to make him a more sturdy playground. He loves to climb, so I have to make sure there’s no way for him to climb out. He has sharp teeth, but a terrible overbite, so I don’t think that’s a major issue. I wonder if there is some sort of Architectural Digest for hedgehogs? Or maybe a hedgehog whisperer to tell me what he’s thinking? For the moment, I’ve given up the hope of having another snuggly hedgehog. Right now, I’m just hoping to get him to the point that he doesn’t make me think of Cujo every time I pick him up. One thing at a time. Eventually he’ll discover what he was missing in turning down all those tummy rubs. In the meantime, I’m keeping the gloves handy.